Once you know some of the details of your celebration, save the dates are a great way to inform your guests. Remember to keep it simple. Save the dates are intended for your guests to reserve the date on their calendar, as well as to begin making travel arrangements. Save the dates are where you can quickly announce your engagement, wedding date, city and state, and wedding website if you have one. 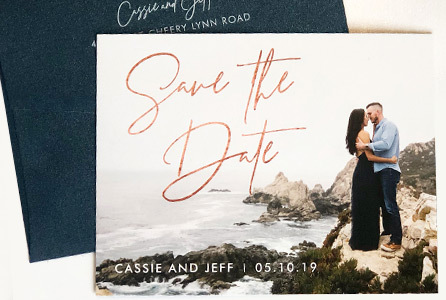 Some popular choices for save the dates are flat or layered cards with envelopes, magnets, or cost-effective double sided postcards. Many couples choose to include an engagement photo, but it isn't necessary. 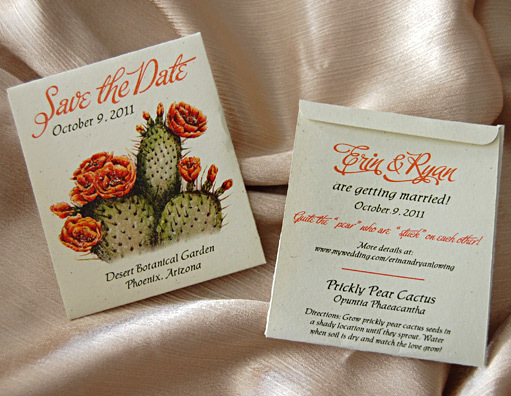 Other creative options are save the date seed packets, coasters, or basically anything you can think of! The possibilities are endless. Save the dates are your opportunity to have fun, even if you are having a formal event.